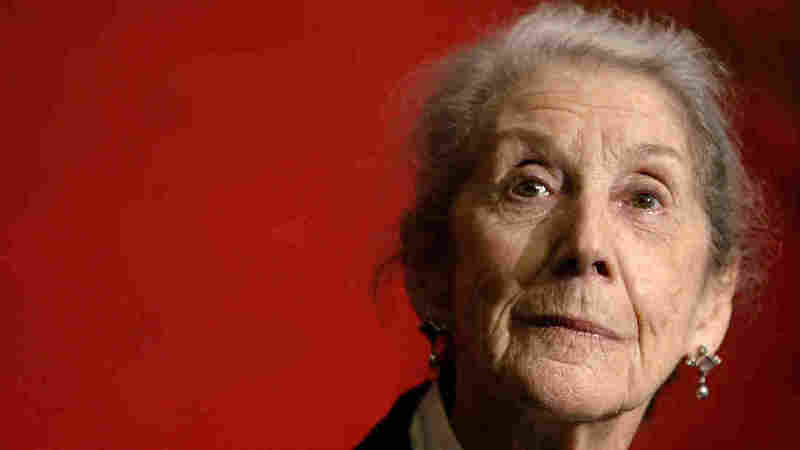 Nadine Gordimer, Nobel-Winning Chronicler Of Apartheid, Dies : The Two-Way Gordimer found her central theme exploring the human effects of racial injustice, but her work continued long after South Africa's apartheid regime had ended. Gordimer, shown here in 2006, died in her sleep Sunday at home in Johannesburg, South Africa. Nadine Gordimer, a Nobel Prize-winning author famed for her portrayals of South Africa under apartheid, died Sunday, her family said in a statement. She was 90. Gordimer was considered a modern literary genius, an important chronicler of the injustices of racial segregation along with other white writers such as Athol Fugard and J.M. Coetzee. "Her proudest days were not only when she was awarded the Nobel Prize for Literature in 1991," her family said in the statement, "but also when she testified at the Delmas Trial in 1986, to contribute to saving the lives of 22 [African National Congress] members, all of them accused of treason." Gordimer became active in the African National Congress — which was then banned but is now South Africa's ruling party — after the Sharpeville massacre of 1960, in which dozens of people were killed. Three of Gordimer's books were banned during apartheid. "They showed how people were living here," Gordimer said in an NPR interview last year. "They showed what influences were shaping our lives. And they showed the many different reactions to it among different people here." Gordimer was one of the first people Nelson Mandela wanted to see upon his release from prison in 1990. A copy of her 1979 novel Burger's Daughter, which explored the family life of the children of revolutionaries, had been smuggled into his hands while he was imprisoned. When they first met in the 1960s, Gordimer recalled in a 2009 interview, "we talked politics, of course. What else would we talk about?" But she wrote in a New Yorker essay published upon Mandela's death last year that when they met a few days after his release from prison, he wanted to talk not about politics, but about his discovery that his wife had cheated on him. This reflected in a way Gordimer's fiction, in which politics were always present but the personal was never forgotten. In 1981's July's People, a white family flees an armed rebellion and ends up increasingly reliant on a boy who had been their servant, turning the power relationship between white and black on its head. As reviewer Maureen Corrigan noted of Gordimer's 2012 novel No Time Like the Present on NPR's Fresh Air, Gordimer's characters continued to grapple with politics after the end of apartheid, but found the country had become "much more morally ambiguous." "Human beings must live in the world of ideas," Gordimer said in an interview with The Paris Review 35 years ago. "This dimension in the human psyche is very important." Gordimer was born in 1923 in South Africa to immigrant Jewish parents, her mother English and her father a Lithuanian who had fled the pogroms of his home country. She began writing early and published her first short story when she was 15.